This dog carries two copies of KB which prevents expression of the agouti gene (A locus) and allows for solid eumelanin (black pigment) production in pigmented areas of the dog. However, this dog’s coat color is also dependent on its genotypes at the E and B genes. This dog will pass on KB to 100% of its offspring. This dog carries one copy of KB and one copy of ky which prevents expression of the agouti gene (A locus) and allows for solid eumelanin (black pigment) production in pigmented areas of the dog. However, this dog’s coat color is also dependent on its genotypes at the E and B genes. This dog will pass on KB to 50% of its offspring and ky to 50% of its offspring. This dog carries two copies of ky which allows for the expression of the agouti gene (A locus) which can result in a variety of coat colors including sable/fawn, tricolor, tan points, black or brown. However, this dog’s coat color is dependent on its genotypes at the E, A and B genes. This dog will pass on ky to 100% of its offspring. The KB variant of the CBD103 gene promotes eumelanin (black pigment) synthesis by blocking agouti gene expression at the A Locus which would otherwise inhibit MC1R production of eumelanin. The alternate ky variant of the CBD103 gene disrupts the normal function of the CBD103 gene allowing for agouti (A locus) gene expression and the inhibition of black pigment synthesis. Because KB is dominant, only one copy of KB is required to inhibit agouti gene expression. Genetic testing of the CBD103 gene for the KB variant will determine whether a dog is a genetic Carrier of agouti gene expression. 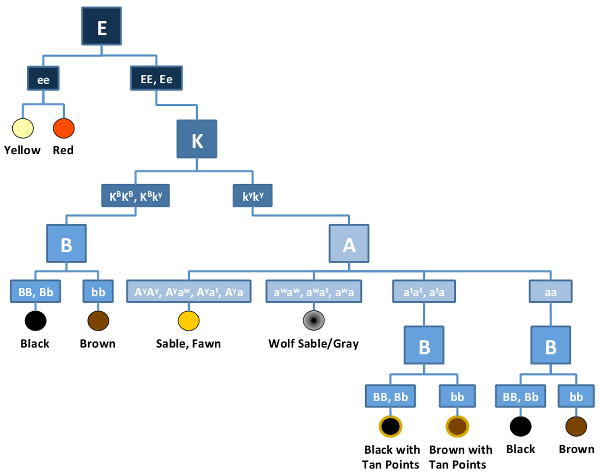 Located just below the E/e Locus on the known canine coat color genetic interaction flowchart, the K locus is important to understanding whether or not a dog will express agouti traits in its coat color or if it can pass on agouti expression to its offspring. Dogs with one or two copies of KB will not express agouti coat colors (sable/fawn, tricolor, black and tan, or tan points) and their coat color would be solid in pigmented areas as determined by the E and B genes. However, dogs with a ky/ky genotype allow agouti expression and can produce puppies with sable/fawn, tricolor, or tan points depending on the genotypes present at the A locus.